Now that it's November, is anyone else super into the holidays? I'm a holiday person, but I'm not yet ready to fully embrace the Christmas music and Christmas trees. Also, I'm dreading the snow. Fall is my happy place. Thankfully, we still have a few more weeks of fall weather (I hope!). In that case, let's continue to put pumpkin in errrything! This time we're making some hummus! I went through a pretty serious hummus phase last year. I swear I need a new hummus category in my recipe index to capture all those recipes. However, I've been slacking off on making it lately. Now it's time to get back into the swing of things. 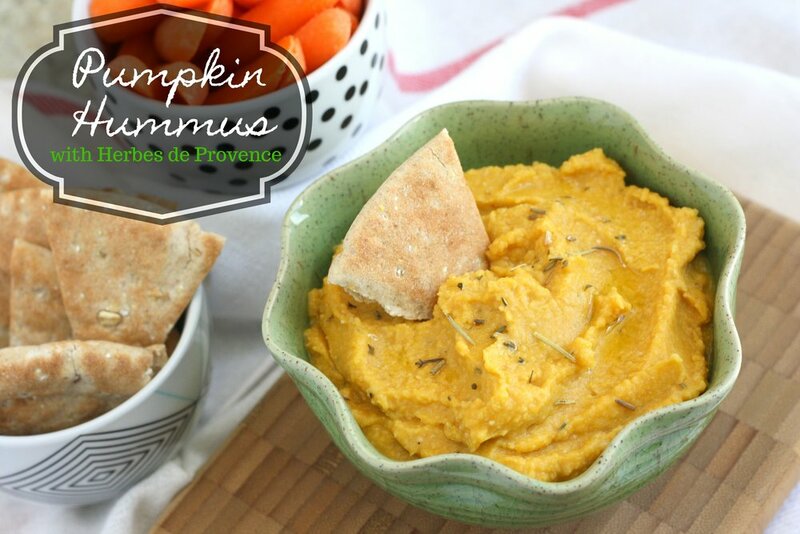 In this case, we mixed the pumpkin with the chickpeas, added some herbs and blended it all together to the desired consistency. You can use any herbs you like, really. I chose to use Herbes de Provence because I'm in love with it, but you could use rosemary or thyme instead, for example. Pair the hummus with carrots, pita, and/or whatever else you like. I wouldn't be mad if you smear this on top of a slice of toast and just eat it like that. No shame! 1) Add all ingredients into the bowl of a food processor. Blend until it reaches the desired consistency, adding more olive oil and/or water if necessary. 2) Serve with pita and vegetables.